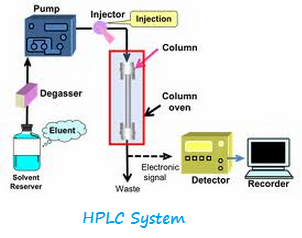 Know the procedure to calibrate the High Performance Liquid Chromatography ( HPLC) including leakage test, flow rate, reproducibility and linearity, lamp energy and pump pressure drop in Pharmaceutical Quality Control. 1. Ensure that, the instrument is ready for calibration and Start-up procedure is followed. 2. Place inlet tubing of the Pump into the Water HPLC grade through a suction filter. 3. Allow the mobile phase to flow for about 5 min. 4. Block Pump outlet with the block screw. 5. The pressure rises and on crossing the 300 bar, “ERROR P-MAX” appears on the display window. Note the time. Press “CE” key and observe the pressure drop for 5 min. 6. After 5 min., record the pressure in the Calibration Log. 7. Make entry of the HOLC column usage in the Column Usage Log Register. 8. Make entry of the user into the Instrument Usage Log Register. 9. Compare the result for its compliance with the limit given in the Calibration Log and put the remark regarding the HPLC chromatography Calibration Status. 10. In case of non-compliance, follow the Maintenance Program. 2. Ensure that, the Pump is passing the “Leakage Test (By Pressure Drop)”. 3. Keep the Drain tube in such a way that the mobile phase (Water) drops falls into 10 ml clean, dry volumetric flask without touching the walls of the flask and start immediately the stopwatch when the first drop falls into the flask. 4. Wait till the collected mobile phase reaches 10 ml mark of the volumetric flask and Stop the stopwatch. 5. Record the time required to collect the 10 ml mobile phase in the calibration log. 6. Repeat the procedure for 1.0 ml, 1.5 ml and 2.0 ml/ min. flow rates. 7. Repeat step 3 to 6 but using methanol HPLC grade as mobile phase instead of water. 8. Compare the results for its compliance with limits given in the Calibration Log and put the remark regarding the Calibration Status. 9. Make entry of the usage of the instrument and HPLC column in the Instrument Usage Log Register and Column Usage Log Register respectively. 10. Prepare Calibration Status Label and display on the instrument at the designated place. 11. In case of non-compliance, follow the Maintenance Program. 1. Take clean and dry 50 ml volumetric flask. 2. Pipette out 1.0 ml of Benzene and Toluene into the clean and dry 50 ml volumetric flask. 3. Make up the volume to 50 ml with Methanol and mix well. 2. Ensure that, the instrument is set according to the Chromatographic conditions. 3. Follow the Instrument Operating procedure, Inject 10 µl in triplicate and record the chromatograms. 4. Repeat the injection of the above solution by injecting 15, 20, 25, 30 µl in triplicate. 5. Take the print out of the chromatograms and attach to the Calibration Log. 6. Record the Area and Retention times of the of the Benzene and Toluene peaks in the Calibration Log. 7. Make entry of the usage of the instrument and HPLC column in the Instrument Usage Log Register and Column Usage Log Register respectively. 8. Plot the curve for the area corresponding to Benzene to Toluene peaks v/s injection volume, Find out the RSD (reproducibility) and record in the Calibration Log. 9. Find out the Correlation coefficient “r2” for each peak at five levels and record in the Calibration Log. 10. Compare the result for its compliance with the limit given in the Calibration Log and put the remark regarding the Calibration Status. 11. Prepare Calibration Status Label and display on the instrument at the designated place. 12. In case of non-compliance, follow the Maintenance Program. 2. On the Detector’s display window, some values at the functions “l(nm)”, “abs(AU)”, “range(AUFS)” and “lamp” appears. 3. On the display, previously set value blinks at “l(nm)” function, enter the wavelength to 254 nm by pressing numeric keys. 4. Press “Func Back” key and select “lamp” functions, enter 1 to select D2 lamp. 5. Further press “Func Back” key till “REF EN ” appears. 6. Record the Reference Energy of the D2 Lamp at 254 nm in the Calibration Log. 7 Compare the result for its compliance with the limit given in the Calibration Log and put the remark regarding the Calibration Status. 8. In case of non-compliance, follow the Maintenance Program. 1. Take three clean and dry 50 ml volumetric flasks. 2. Pipette out ml of Benzene and Toluene as per the following table into the clean, dry 50 ml volumetric flask separately. 1. Set each of the equipment to the following parameters as per the Equipment’s Parameter Setup Procedure. 3. Follow the Instrument Operating procedure, Inject each of the Solutions in triplicate and record the chromatograms. 4. Take the print out of the chromatograms and attach to the Calibration Log. 5. Record the Area and Retention times of the of the Benzene and Toluene peaks in the Calibration Log. 6. Make entry of the usage of the instrument and HPLC column in the Instrument Usage Log Register and Column Usage Log Register respectively. 7. Calculate the Area Ratio of Benzene to Toluene, Find out the Mean value of the ratios and record in the Calibration Log. 8. Find out the Correlation coefficient “r2” from the Mean area ratio values of the three levels.and record in the Calibration Log. 8. Plot the curve for area ratio corresponding to Benzene to Toluene peaks v/s concentration, Find out the RSD (reproducibility) and record in the Calibration Log. 9. Compare the result for its compliance against limit given in the Calibration Log and put the remark regarding the Calibration Status. Taken _____ ml (1.0 ml) of the ________ (Benzene) and ________ (Toluene) in to a _____ ml (50 ml) clean, dry volumetric flask, make up the volume with methanol, mixed well. Mobile Phase Preparation : Taken ______ ml of ___________ (Methanol HPLC grade) in to a _______ ml clean, dry volumetric flask, added ____________ ml of ___________(Water HPLC grade), mixed well, allowed to cool to room temperature. Filtered through 0.45/0.22 m membrane filter, degassed for _____ min. by vacuum / sonication. What is the difference between calibration and performance check? Some time caffeine is using for the calibration why caffeine using for calibration? Very good Very useful for HPLC users. Expect such helpful information in future. Thank you. what is the importance of carryover test in calibration? why we have to do?